When you get to know the Azera, you'll get to know best-in-class interior space, next-generation technology and premium style. It's been called the "best-looking car in the large-sedan class" by Kelley Blue Book's KBB.com, and also "brings lots of style to a segment known for conservative design," according to Edmunds.com's last Hyundai Azera review. On top of looks, the five-seat sedan also flaunts a generous equipment list, spacious cabin and potent V-6. Top this off with "America's Best Warranty" and the Azera stands out as an ideal pick for any full-size sedan shopper. 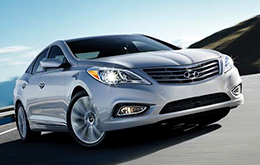 You can find the 2014 Hyundai Azera for sale in Carrollton, Texas, near the Dallas-Fort Worth Metroplex. The base model is now offered at a lower starting price, yet gains added amenities like driver blind-spot mirrors, a rearview camera, three years of Hyundai Assurance Connected Care and a new 6-inch color LCD audio display. Luxury-minded car buyers can also choose an all-new Limited model, which includes all of the features on the base trim and adds power-folding side mirrors, an electroluminescent gauge cluster with a color LCD trip computer and a new 8-inch navigation screen. The base and Limited Azera both come outfitted with a 3.3L V-6 engine that produces 293-horsepower and 255 lb.-ft. of torque. The V-6 is mated to a six-speed automatic transmission and front-wheel drive is standard. 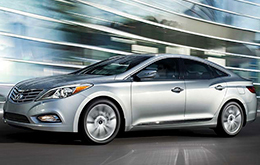 Visit Van Hyundai to test drive the 2014 Azera in Carrollton today and experience its swift acceleration and smooth driving dynamics. To schedule an appointment with a sales rep, please call or fill out our contact form. 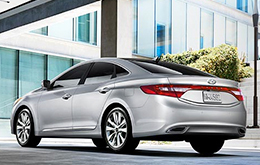 In the continuation of our 2014 Hyundai Azera review, you'll find a list of notable vehicle specs and a video tour. 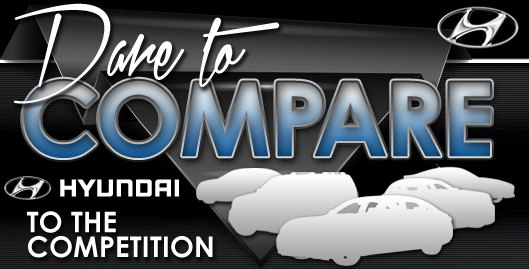 You can also try out our Dare to Compare feature to see how the Azera stacks up against the competition. We're condifent that the Azera is an ideal fit for you. That's why we double dog dare you to compare Hyundai's latest model side-by-side with the 2014 Toyota Avalon, Chrysler 300, Ford Taurus and the Buick Lacrosse. Shoppers will enjoy the Azera's competitive price, as well as its handsome exterior design. You'll easily see that when compared to the forementioned vehicle options it's a remarkable value in regard to price, which is why many Dallas Hyundai customers choose it. Get more useful facts - Look over our Azera Quick List under this paragraph! We know your next Hyundai purchase is important; that's why we've provided the 2014 Azera review above, along with reviews of prior models. Because it's rare to get reviews with up-to-date? specs on dealer sites, we've made it our responsibility to provide reviews from expert writers. Filled with worthwhile data and specs, including powertrain options and other info, each overview gives you full access to everything Hyundai's lineup has to offer. Want to read other Hyundai car comparisons and reviews? Then visit our digital research directory, where you'll learn about other new vehicles for sale now at Van Hyundai.